My name is Kelsey and I am a recent graduate with an MBA in Marketing and a BS in International Business. I love to write and am always in search of things I am passionate for. Join along in my life adventures as I attempt to stay sane in the midst of beginning a full-time career. I briefly touched on the running shoes I was running in a couple of months ago. I had gotten them at a running store where I ran on the treadmill they had set up and then assessed my form while running. When I first started on the treadmill, I remember the worker saying my feet were pretty good and that I would probably just need a lightly supported shoe. Well, like four pairs of shoes later I walked out with one of their most supported contraptions. I felt good about it. I thought that I was going to be a much better runner now that I was fitted and prepared! I didn’t actually notice much difference from my previous shoes, except I could tell the old ones were wearing out so I desperately needed new ones. These were nice and sturdy and I was able to transition straight into them and didn’t have to ever go back to my old shoes. I never thought twice about my shoe choice until reading the book, Born to Run. Kinley recommended it to me after she read it and I couldn’t put it down. Although it probably helped that I was able to spend a big chunk of my day reading! Needless to say, the idea of going barefoot was stuck in my mind. I even became very self-conscious wearing my older shoes because I didn’t want to end up de-strengthening my feet and they all of a sudden felt so weighted down! One thing I knew was important was easing my feet into minimalism. I started transitioning before I even had a new pair of shoes, mainly by taking barefoot walks around the block with the pup (around 1/2 a mile). I didn’t technically need another pair of shoes at the point of me reading the book, so this was a good alternative and starting point to get my feet strengthened! I finally decided to purchase a new pair of minimalistic running shoes when I found a flier in Kinley’s swag bag from the Summerfest 1/2 Marathon she ran in July for a new natural running store that just opened in Wauwatosa, Revolution Natural Running & Walking Center. One of the following weekends we ventured there and I picked up my new kicks, a pair of Inov-8‘s. 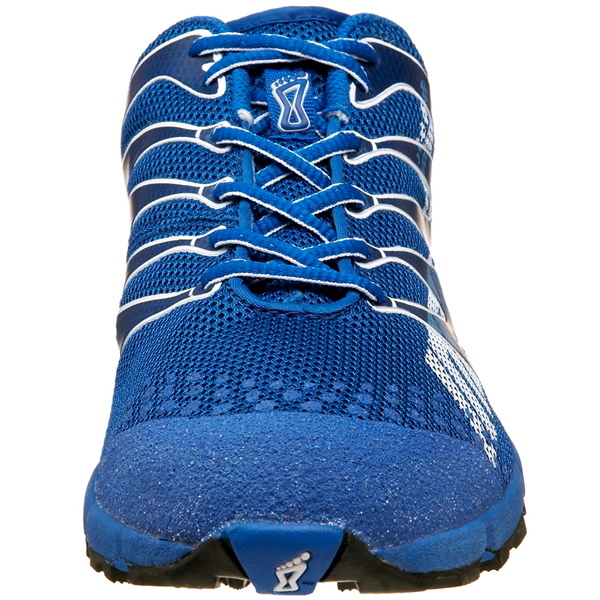 These are classified as a transition minimalism shoe – meaning they still have some support and the variance between the height of the heel and the height of the sole is greater (regular shoes = 12mm differential, barefoot = 0mm). These shoes are a 6mm drop, so half way down. Revolution also offered inserts for the heel of the shoe (3mm) to increase it to 9mm to make the transition easier. I am currently still in the 9mm stage but can’t wait to drop down! The hardest change for me has been focusing on my running form. I hadn’t ever put any thought into running – heck up until last fall I never ran so what did I care? So my form is pretty typical to the average person – a total heel striker. Meaning? My stride goes from heel to toe, heel to toe… and that form is not ideal for keeping your legs and joints in tip-top shape. Rather than running without thinking about it, I now try to actively make myself focus to run on the soles of my feet – no touch of the heel required. Sounds easy, right? Well I’m here to tell you it’s not. The transition can be painful. I did go to a running clinic offered by Revolution (free with the purchase of a pair of shoes!) and I got to see myself run in slow motion (scary) and also take a look at my form. We ran by the camera twice. First, with shoes. Next, completely barefoot. And you know what? When I was running completely barefoot my form was perfect without me even having to worry about it. It’s just that darn gravel thrown across the ground that makes me wary of going too far! It’s harder for me to get a nice form with shoes on, but I’m trying. I am still easing into it to avoid calf pain (I was a little overzealous the weekend of the running clinic and overdid it a bit – my calves were sore for over a week). I am running once a week in my new shoes – especially focusing on my form. Just a short distance – around 2miles but sometimes 5k if I’m feeling up to it. Eventually I want to do all my running in these shoes but I am pretty much starting from scratch in terms of my running with the new form so slower is definitely better. Plus, I still have plenty of time to work up to wearing these shoes 100% by the time I run my 1/2 Marathon in Disney! I also really would like a pair of Vibrams so I can take longer barefoot walks :). 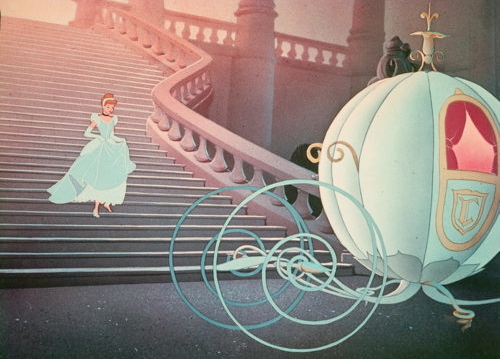 See, Cinderella wanted to run barefoot too! I don’t ask questions very often, but I’m curious. 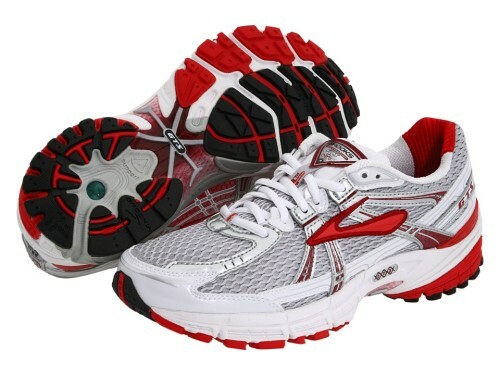 Have any of you tried a minimalistic running shoe or are you loving your ‘normal’ shoes for running? You know what else goes well with running? Granola. (The gluten-free version was made tonight :) ).